Centipedes may not be the most harmful household pest, but they can certainly be an unappealing nuisance. Here's how to quickly and easily evict these leggy lodgers from your home. 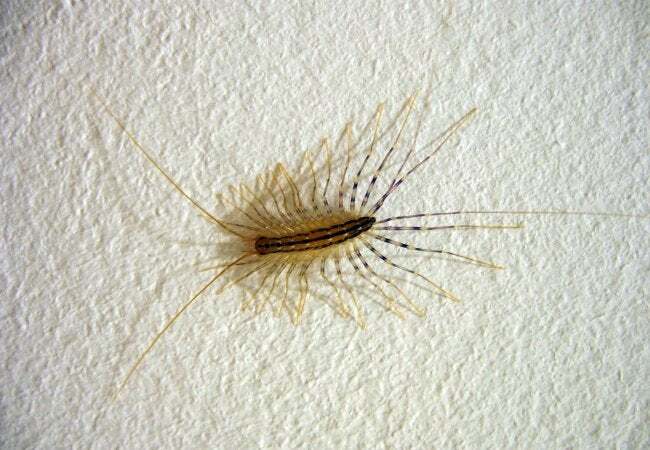 Centipedes, with no shortage of legs and alarming speed, seem to have been designed to make squeamish homeowners shriek. But despite their somewhat frightening appearance, centipedes are—for the most part—harmless, even somewhat helpful. They won’t damage your foundation, siding, or furniture; they’re not interested in the food in your pantry; and they come out at night and eat the terrible bugs that you don’t want hanging around, like termites, moths, roaches, and even bed bugs. If you’re not squeamish, you might consider just leaving centipedes alone to do what they do best—killing destructive pests with poisonous venom and then considerately gobbling them up so you have nothing left to clean. But if you find creepy-crawlies just too disturbing to live with, there are several things you can do to rid your spaces of centipedes. Capture: Centipedes are fast, but they don’t generally invade in large numbers. If you can trap the ones you see and either squish them or relocate them outside, you’ll be well on your way to controlling the problem. Simply isolate the centipede under a jar a cup, slide a pice of paper over the mouth of the container, then relocate the bug outdoors, being sure to deposit it as far away from the home as possible. Do not touch a centipede with your bare hands—they do bite. Although they are not prone to attacking humans, one might bite in self-defense; the bite would feel similar to a bee sting. Trap: Sticky traps, such as those used for other insects and rodents, are effective at catching centipedes. Purchase a set of sticky traps at your local home center and place them near baseboards and in the corners of rooms. The advantage of the sticky trap approach? You don’t just capture centipedes; you also capture any bugs in your home that the invading centipedes are feasting on. Indeed, inspecting your sticky traps carefully may reveal that your pest problem extends beyond centipedes. That wouldn’t be welcome news, but it’s important to know what you’re dealing with. 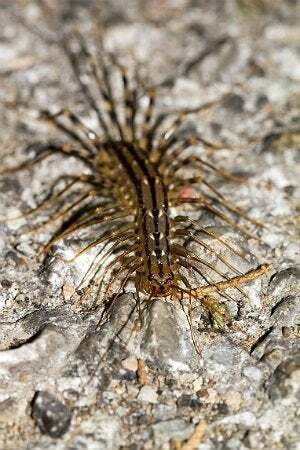 Outdoors: Centipedes like to hide and breed within leaf litter, grass clippings, and other damp yard materials. Clear away this outdoor debris and keep it a fair distance from your house. If you store compost or firewood, move it at least 30 feet away from your home’s perimeter. Inside: Use an expanding foam spray to seal up any gaps, cracks, and crevices around your windows, doors, siding, pipes, and wiring. Doing this will keep out not only centipedes, but rodents as well. Centipedes love damp areas like bathrooms, basements, closets, and even attics; in fact, they’ll dry out and die without moisture. Invest in a dehumidifier, and install exhaust fans in your bathrooms or attic if you haven’t already done so.